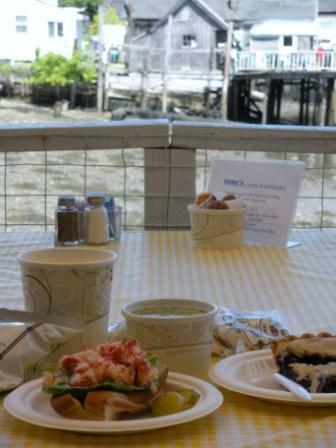 "This NH Hidden Gem Serves The Best Chowder You've Ever Had"
Stop by today for a great dining experience! Ask us to show you the lobster boats that supply the restaurant. You can see them from our deck! We specialize in classic New England style chowders and stews, lobster rolls and seafood dishes that you are sure to enjoy.Our lobster is locally caught and fresh daily. We can show you the boats that caught your lobster right from our deck! For us, these recipes are more than just food and our restaurant is more than just a place to eat. Our chowders and stews are made from scratch. We don't use mass produced bases or fillers and thickening agents like other restaurants. We offer a taste of the chowder before you order, so you will know exactly what you are getting. Our lobster is locally caught and our lobster rolls are made to order.The lobster rolls are made the way you want it, with mayo, without mayo, with butter or just plain. We want to create a completely comfortable experience for our diners. From our friendly service to our relaxing casual atmosphere, we welcome you to come in and take a break from the prepackaged chain food fare. We will point out the boats that supply our lobsters. We serve simple straightforward food, nothing fancy. Come an experience a bit of "old Portsmouth", where the locals eat. As seen on "Cheap Eats"
Check us out on Google , Facebook or TripAdvisor more!